3 copies. 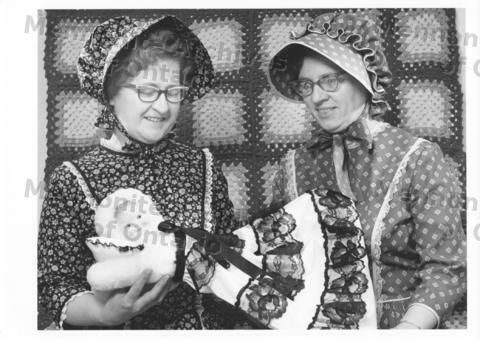 Alice Snyder & Pearl Cressman in centennial costume displaying a pyjama doll for the Relief Sale. Used May 27, 1971 in K-W Record ad & in the MRS brochure of '70 & '71. See XIV-3.2.4 & XIV-7.3.2.1 MRS files in MAO.